← Email tip for Hotmail/Live/Outlook.com users …. Electrical item stopped working ? If a computer or other small electrical item suddenly stops working, FIRST CHECK to see if the plug’s fuse needs replacing (so keep spares of 3A, 5A + 13A). 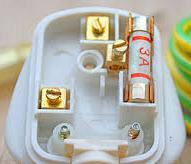 With a conventional plug (as above) you’ll need a screwdriver to open the plug … but with a newer moulded plug (see below) you just need to remove the cover. Posted on March 17, 2014, in Troubleshooting Zone and tagged electrical, FIRST CHECK, fuse, molded, moulded, plug, screwdriver. Bookmark the permalink. Leave a comment.